After getting sufficient rest (barely) following the late Saturday night I had in Sunderland, I managed to arrive in Newcastle's main train station at the proper time (15 minutes early in fact). Which was much more than could be said for my pre-booked train, which wasn't in fact 'late' so much as it was, um, 'cancelled.' But that's ok... they have trains to King's Cross/London leaving every half-hour, though the next one (*not* cancelled!) came limping in 45 minutes behind schedule. (When you do the math, you then realize that in the time that three trains should have arrived, in fact none had.) Despite there now being a huge mass of impatient travellers on the platform, I managed to sneak into a less-occupied car and settle in. Of course, while my trip north on GNER was made in oppressive heat, now *this* coach was exceedingly cold... average it out and you'd get the perfect temperature, so what do I have to complain about, right? Well, all one needs to hear that sums up the current state of the British rail system, is that they have felt the need to put up posters in certain waiting rooms that outline the penalties for physically abusing the staff. Living in Switzerland certainly spoils me, but it's getting ridiculous there in the UK. OK, diatribe mode off... the important thing is that I *got* there for the Hawkwind concert, and that my friends, is what really counts. Though I had only a brief chance to meet cyberfriends (from mainly the boc-l list) at a nearby pub. Which turned out to no longer be serving food by the time I'd arrived, so I was off again in search of a BSE-free meal somewhere in the vicinity. By this time, I'd already passed in front of the Astoria Theatre once or twice, so no chance of getting lost on the way to the gig. Happily, the will-call attainment of my pre-booked admission went ridiculously smoothly, though it took me a minute or two to snake through the passageways to find the place where one actually enters the theatre proper. That taken care of, I arrived to find that the opener Tarantism had already began their performance. In retrospect it seemed that at most I must have missed only about one song, and really it didn't much matter, as I'd seen them twice at Hawkfest '03 (unlike MQB, they played an identical set, or so it seemed). Here too, I recognized almost every tune they played. Well, ok, they're a decent enough band, reasonably-creative uptempo folksy music with flutes, multiple layers of percussion (which endears them to one Richard Chadwick I imagine, who I found myself suddenly standing next to on the floor just by chance) and a "cheerful personality," if you will. Though because the circus-tent environment at Hawkfest was such a better venue for them, I felt that I wouldn't get much out of it this time 'round, and then spent most of the time wandering around (including up to the top of the massive balcony section) looking for the place which would be the best (both aurally and visually) to view Hawkwind when the time came. Sometimes, this is all warmup bands are good for. But hearing Tarantism again was far from being as painful as a spider bite, and it was nice to see them get the spot on the bill. Next year, I hope to see someone new again get a shot... especially a band I haven't already seen. When Hawkwind came onstage, I had managed to wriggle myself into just about the right spot following my mobile 'soundcheck' (later, I switched to the other side, just for a different perspective), but then I was immediately disheartened when the band 'tore' into one of my favorites "Arrival in Utopia," and it sounded like absolute rubbish. Sigh. The Astoria hall is quite large (the huge volume of air in front of that balcony section gives it quite a strong 'hollow' effect) and everything was seemingly lost up into the "rafters." For the first minute or two, I couldn't hear much of anything from Dave Brock (guitar, vocals, or keyboards), but you could tell something extreme was happening back at the sound desk, because throughout the song the levels of *everything* kept changing. (In the end, many openers at big arena shows I find are 'throwaways' due to crap sound, so I wish they'd all start with my *least* favorites! Oh well, I've heard "Utopia" live on several earlier tours including '89, so...) So, really, I was overjoyed that the sound/mix soon became not just acceptable, but actually rather good, considering the circumstances. One thing that they never could *quite* get around was the 'diffuse-bass' problem, where Alan Davey's bass guitar really lacked the "punch" that it should have when he hit any particular note. Nothing anyone could do about it, I imagine. It was certainly loud enough, but the definition wasn't quite there... although it also improved later on. OK, so, the new track "Angela Android" came next, with drummer Richard Chadwick taking a lead role, both in delivering the (seemingly low-brow) vocals against a human/machine-hyrbid beat and little else, so it seemed. Oh, yeah, except that one Lene Lovich (who from reports was once quite famous in the UK, but in the states she remained pretty much "undiscovered" so I wouldn't have had a clue who she was if it weren't for the pre-gig announcement of her intended guest appearance) came onstage in a crazy costume, and a hairdo big enough for Carmen Miranda to have considered a watermelon or two. Her vocal coloratura was not so much full of prose as it was useful in the same way as DikMik's so-called "Audio Generator" c. 1973. And actually, I was reminded of the foot pedal that Ron Tree used with Hawkwind not long ago that made his voice artificially shoot into stratospheric frequencies. Lovich appeared again at several stages during the evening's performance, and she fulfilled similar duties each time. I can't say that she did anything to either spoil or greatly enhance the festivities... for me, she was just kinda 'there.' At the gig (welcome surprise) was available the just-finished live CD from last year's Christmas show featuring Arthur Brown (entitled "Spaced Out in London"), and upon hearing that just days later, it was obvious to me that Brown had much more to offer. He was unavailable for this event apparently, but has made some contributions to the new studio recordings. Seemingly everyone's favorite (including mine) "Assault & Battery" came next, followed (naturally) by "The Golden Void," the transition between the two always threatening to make me suffer an emotional breakdown. In a 'good' way, I mean. If hearing it on the album (the best 10-minutes of music history, if you ask me) wasn't enough, then it was the 1989 tour (my first live-Hawkwind, or in fact, space-rock experience) that I always reflect upon when hearing it again. Here was a similar version, but not as long-winded at the end. Instead they segued into the obscure "Where Are They Now?" (you can find it on one of the Weird Tapes CDs... No. 5 I think), which is quite good in its own right. After a bit of instrumental 'noodling,' the first half of the set wrapped up with Bob Calvert's "The Right Stuff" and then a bouncy "Hurry on Sundown" if the former wasn't quite 'classic' enough. To this point, we'd also seen a pair of svelte female dancers in tight-fitting white outfits flanking Alan Davey at center stage. And of course, a lightshow projected onto the usual white screen in the back... here, it didn't really show so well though, as there was an unusually high amount (for a Hawkwind gig anyway) of ambient light on the stage itself... plus, it was a *really* deep stage, giving Davey almost *too* much room to wander about. Dave Brock then introduced Huw Lloyd-Langton as he entered stage right with his acoustic guitar. Essentially as an intermission, Huwy then played a 15-minute solo set featuring some of his compositions from the 1980-83 period. Now, I'd seen Huw both at the Hawkestra event in Brixton (2000) and then again this summer at Hawkfest '03, both times wondering whether would ever be able to play the guitar competently again. And this year, it seemed his overall health was in question. But then, I have also heard the Canterbury live recording (2001), where he sounded like his old self. Well, I won't pretend to know exactly what's going on in Huwy's life... all I can say is that he seems to be back on the right track again, so let's hope he continues to get it together. I wouldn't say his playing was *perfect* at the Astoria, but he looked in good spirits, his voice was strong, and his fingers were once again quick and nimble upon the frets. The versions of "Solitary Mind Games" and "Waiting for Tomorrow" were interesting enough, though limited by the fact that he was out there alone. All in all, my third viewing of HLL in person was the first positive one... I wish he'd come back out on electric for the encore or something, but sadly that didn't happen. As Huw wrapped up (most of the audience had hung around, so no more waiting), the other four re-emerged (including ever-more-frequent-guest Keith Barton, of Spacehead, on guitar) and rather gently refired their engines with Davey's thoughtful "Wings." I might have preferred his take on Lemmy's "The Watcher" instead, but they'd done that last year, so that's fine by me. "Ejection" saw Davey also handling lead vocals as is normally the case, and although he's never been able to do justice to the song, this version was improved at least by Chadwick filling in the counter-lines of the chorus. Actually, Chadwick did quite a bit of additional vocals throughout the evening, and I think it helped some... his voice is not a thing of beauty perhaps, but he can sing in tune and I quite liked what he contributed. One of my favorite 80s tracks "Heads" came next, Brock delivering Roger Neville-Neil's wonderful lyrics in an appropriately sinister way. The synths and rhythms were slightly different than any previous version, and it seemed that they put in a lot of extra stuff at the end, making it one of the pleasant surprises of the whole performance. What I assume will become a single from the new album, the track "Sunray" was then unleashed... it does seem to have some strong possibilities to reach a wider audience, maybe even moreso than "Right to Decide." And just before the finale, another great move...the tired old "Brainstorm" (and "Silver Machine") was put aside this night, and instead they played the non-album track "Brainbox Pollution." I never thought much of this one in the past, but it here it was much more lively and interesting for some reason. I think Chadwick helped on vocals here too, which was part of the reason. The finale itself was more predictable though, the staple merging of "Assassins of Allah" with the trancey "Space is Their (Palestine)," the one moment of repetitiveness (ok, laziness) we got in the main set. 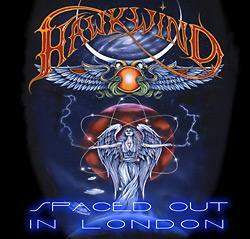 Still, I imagine that those who only see Hawkwind on rare occasion consider it a highlight... I can't say that it hasn't always 'worked' to some degree. The encore started with "Spirit of the Age," which they had done also at Walthamstow 2002 (but sadly wouldn't fit onto the new CD). Anyway, it was nice to hear again and it always gets the crowd going. "Master of the Universe" finished everything off, with the Brock/Barton duo able to put enough guitar sound together to offset Davey's still-boomy bass. As the last riffs were finally abating, the synth intro to the "Welcome to the Future" outtro began from Brock's rig. But, unless my eyes were playing tricks on me, I swear he was forced to scramble up his lyric book to recall how it all started out ("Welcome to the oceans in a labelled can..." etc.). I think I could even see that he first opened it up to an index before then finding the proper page. Finally, just as Davey was beginning to wonder and turned his head around, Bob Calvert's words came forth from the mic and the last climax of Hawkwind's performance thundered forth. Including HLL's acoustic break, nearly two hours long... seemed hard to believe. After the show, there was to be an after-gig party somewhere in the vicinity of the theatre, just as had been organized the previous year. But this time, it hadn't been widely announced, and I didn't find out about it until after I'd arrived in the UK and so I didn't even have my (Hawkwind) passport with me for entry. Like others in similar situation, I knew I could probably have talked my way in, but actually I was already pretty exhausted from the night(s) before and the tubes were still open. So I decided to bag the whole idea and just rode the underground back to Paddington determined to get adequate rest. In the end, I heard that the only Hawkwind member to appear at the party was Martin Griffin!